G'morning! How is this Saturday treating you? I hope you've had a wonderful start to your weekend! 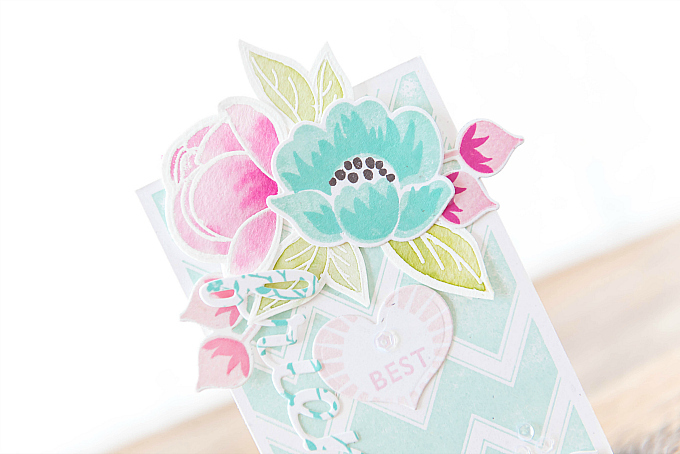 So many beautiful floral stamps to play with and so little time! For today's card I wanted to try mixing solid-style floral stamps (such as Gran's Garden ) along with outline floral stamps (such as Peonies on Parade). I've found that in the past when mixing these two styles together, it's often resulted in a mis-matched, hodge-podge type of a look that I wasn't very fond of. But I think I've found a way to mix and match the two, and I'm happy to say that I love how this sweet marriage turned out on my card today! If you look closely, you'll notice how both stamps have a white outline - either from heat embossing, or from the space left during die-cutting. Also, all stamped images feature a gradient of color, going from soft pink to darker pink, and soft aqua to a deeper shade. I really think that this uniform way of coloring makes all the difference. So if you've struggled mixing your various stamps together, give this a try, and let me know if it works out for you. I sure hope this technique helps a tad and opens up a whole new way to mix and match your current stamps. 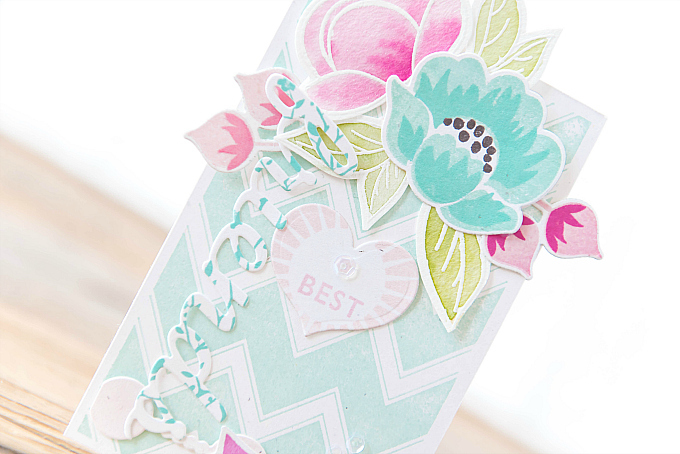 To start today's card, I used an older chevron stamp to create the background. If you wanted a bit more dimension, you could easily use a chevron stencil and pair it up with distress ink, glitter paste, or even some of my favorite Molding Paste and a dab of dye ink for color. To stamp the outlined flowers from Peonies on Parade, I used Versamark ink, embossed with Ranger's Super Fine Detail Embossing powder. For anyone reading about embossing for the first time, this is my absolute favorite combo in achieving perfectly crisp, detailed images. After arranging my bouquet, I scattered a few sweet little sequins in one of my new favorite colors. I find these little gems work so perfectly with almost any type of card. They are a subtle, yet perfect addition in those little spaces on your card that seem a bit empty or need a little pick-me-up. For the stamped flowers, I used colors of Aqua Mist, Hawaiian Shores, Sweet Blush, Pale Peony, Hibiscus Burst, Raspberry Fizz, and Smokey Shadow. For the sentiment, I used some older stamps and dies to create a little radiating heart and bright pink banner, and for the diecut word, I used PTI's Wonderful Words: Friends die, stamped with a delicate floral pattern. 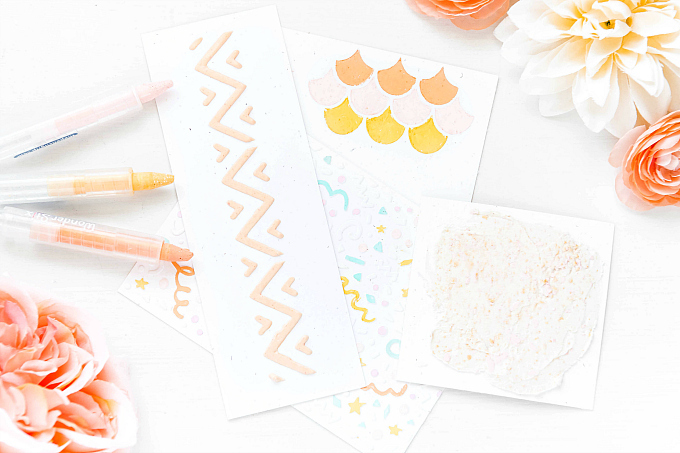 I hope this little mixing and matching tip inspires you to pull out those stamps sitting in the back of your drawers, and pair them up with fresh-new florals, for a whole new take! Wishing you a lovely (and creative) day. What a gorgeously heartwarming card Ivana! I am soooo happy that you got back into your craft room after a couple year break!!! Seeing your work is a true joy and such a wonderful inspiration. Thank you so much, sweet Samra! :) It's so nice to be back and staying in touch with all my dear blog friends again. Biggest thanks for supporting my little blog and for all of your love. Sending hugs! This card is absolutely stunning—thank Yiu for sharing your talent! Thank you so much, dead Debbie! :) Sending you big hugs!